What do Karen’s Equine Biomechanics Clinics include? Karen’s equine biomechanics clinics touch on the fascinating world of equine movement. Her lectures explain to riders the importance of creating and maintaining efficient and healthy posture and movement within their horses. The clinics are made up of three different sessions. 1) PowerPoint lecture. The lecture is filled with pictures and diagrams to help beginners to advanced riders understand how a horse moves and how riders affect a horse’s movement. 2) Horse and Rider Demonstration. Footfall, rhythm and tempo of all three gaits are demonstrated. As the horse moves, muscles groups involved in healthy posture are pointed out and how they affect the horse’s movement are explained. 3) Individual or group riding sessions. Incorporated into the sessions are many exercises that help to relax a horse’s topline, to encourage the horse to move forward with impulsion, and exercises to help the rider to relax and be able to connect to the horses movement. WHO are Karen’s biomechanics clinics for? Each presentation is adapted to the level of experience in the audience – from recreational riders to Pony Club participants to professionals. gain understanding of the importance of healthy muscle development to maintain soundness for their working herds. WHAT is the focus of Karen’s equine biomechanics clinics? 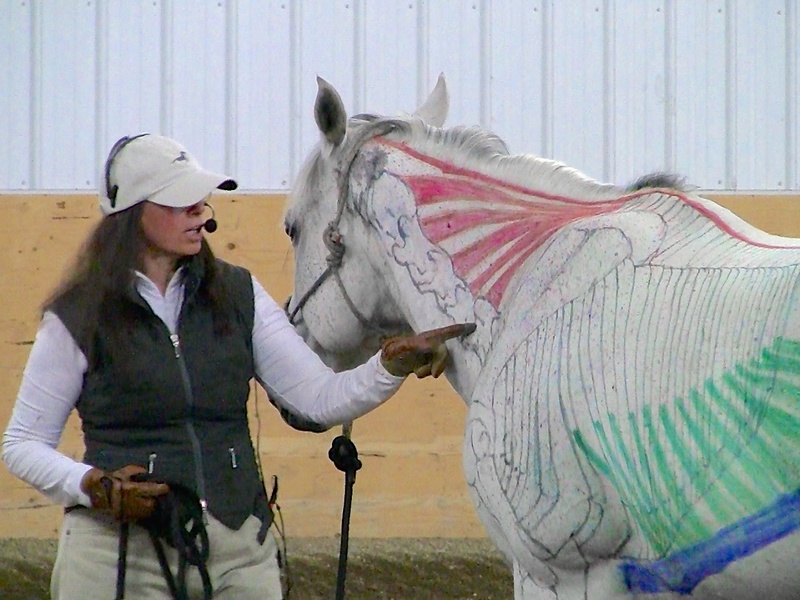 Karen’s equine biomechanics lectures focus on explaining the horse’s musculoskeletal system and how to maximize the healthiest posture for carrying a rider. Additionally, participants learn how a horse’s posture and the rider’s training system can affect each of the three systems. WHY is it important to understand how a horse moves? This leads to the study of movement biomechanics – the study of the functions of the equine body in relation to movement. HOW do riders affect their horse’s movement and WHY does it matter? The way a horse is ridden can lead to chronic unsoundness. Without healthy conditioning, lameness can develop when a horse’s body is repeatedly misdirected: either by constricting the horse’s joints and/or compressing the ligaments, or by compromising the muscles. Riders have good intentions; none intend to cause lameness in their horse. Rider induced lameness is usually caused by a rider’s lack of exposure or awareness of the horse’s anatomy. An understanding of equine biomechanics helps riders develop healthy and responsive equine partners. Through these lecture/demonstrations, participants leave with new skills and exercises that they can implement in their own training and riding programs. WHAT training methods are followed in Karen’s clinics? Karen incorporates classical and groundwork training methods into her biomechanics presentations. She addresses the horse’s posture and how different training methods can help enhance a horse’s physical and mental well-being. Read more on the Classical Principles and RPH Groundwork Exercises that are included Karen’s Clinics. HOW can certain training techniques create lameness in horses? It is well documented that efficient and healthy movement is imperative to keeping our equine athletes sound. To prevent lameness and understand a horse’s movement, it is essential to know how and the horses’ musculoskeletal systems function.When these muscles have been developed, the equine athlete will be able to enjoy moving freely without injury for many years.